Glentrool is a remote area in the Galloway Forest Park, southwest Scotland, 34 miles southeast of Ayr, 9 miles north of Newton Stewart in the county of Dumfries & Galloway. The park has a number of biking, walking and hiking routes, also a number of picnic and rock climbing areas. Three of the top hiking routes in southern Scotland can be found here, The Merrick range up to 2,766 ft, highest in southern Scotland, the Lamachan range on the south side of Loch Trool, and the rocky Dungeon range. The image below is of the entrance to the Glentrool Visitor Centre car park. This area is situated about one mile from Glentrool village on the Newton Stewart Road. Glentrool village is only a few houses with no shops. The car park area here gives information on the skies, as this area is so remote, it is classed as a dark skies area, ideal for viewing the stars. 23 Large Images. The image below shows the Glentrool Visitor Centre that has a cozy tea room, and many leaflets for the area. The park is open all year, the Visitor Centre is open from the beginning of April to the end of October. The image below is of the plaque at the Visitor Centre. The plaque gives information of trails, monuments and visitor attractions in the area. The image below shows the car park at Bruce's Stone monument. This car park is situated three miles east of Glentrool Visitor Centre via a good single lane road with many passing places. The monument is just down the path right in this image. The sign straight ahead is at the start of the Merrick Trail. The Merrick is the highest mountain in southern Scotland, so this car park is normally busy. There is a larger car park 300 yards back down the road. The image below is from the short trail round to Bruce's Stone. The plaques here give information on the wildlife in the area, and information on the Battle of Glen Trool. More Information. The image below is of the Bruce's Stone monument with Eschonchan Hill behind. The Merrick Trail passes the side of Eschonchan, or you can go over this little hill for good views down over the loch. The image below is of the Buchan Bridge, about 300 yards east of Bruce's Stone. If you cross the bridge, and follow a narrow trail up the side of the burn, you will see the Buchan Waterfalls. The image below is of the Buchan Waterfalls. The waterfalls cascade down for a few hundred feet, well worth a visit. The image below is from the northwest ridge of the 1,840 ft Mulldonoch, looking over to Bruce's Stone and car park. Mulldonoch is the start of the Lamachan range hike over five rocky hills on the south side of Loch Trool, up to 2,352 ft. This image shows the Merrick Trail from Bruce's Stone car park. That trail goes over the 2,358 ft Benyallary, then on to the Merrick at 2,766 ft. The image below is of the 2,211 ft Curleywee on the Lmachan range, on the south side of Loch Trool. This is the most interesting of the five peaks on this range, with an eventful ridge leading across to it. Photo Tour of that Hike. The image below is of Loch Dee, about three miles east of Bruce's Stone. You see this loch when descending the Lamachan Range. The image below is a large inscribed stone next to the forest road to Loch Dee, as seen in the photo below. This is the Glentrool Stane, on one of the Glentrool biking routes. There are Seven Stanes, one on each of the Seven Stanes Mountain Bike Trails around Southern Scotland. This stone is about 2 miles out east from Bruce's Stone car park. The image below is from the 2,358 ft Benyallary looking along the final part of the Merrick Trail to the 2,766 ft Merrick summit. This is a popular hike with an easy to follow trail. Just be careful if it is a cloudy day, as the Merrick is normally the first mountain in the area to be covered in cloud. Take note of the trail up, so you can follow it back down if it clouds over. Photo Tour of this Route. The image below is of from the east side of the Merrick looking over Loch Enoch to the rocky Dungeon Hill. Dungeon Hill has about 1,000 cliffs on its east side that attract rock climbers. Rock Climbing Link. The Dungeon Range is only up to 2,270 ft, but is probably the toughest range to hike, as it is rocky with hard to follow trails, and has a number of cliffs all along the east side. The image below is of Loch Enoch from the east side of the Merrick. There are a number of lochs in this area with white sandy beaches, as picturesque as any place in Scotland. The image below is from the Buchan Hill range leading from the Merrick east side back to Bruce's Stone. The loch here is Loch Neldricken with the rocky 2,116 ft Craignaw behind. That range leads down to the Stane by Loch Dee. The image below is of the House o Hill hotel situated about one mile south of Glentrool village. Glentrool village is only about 50 houses with no shops. The hotel here is the only place for a drink and meal in the area. The town of Newton Stewart is situated about 9 miles south. 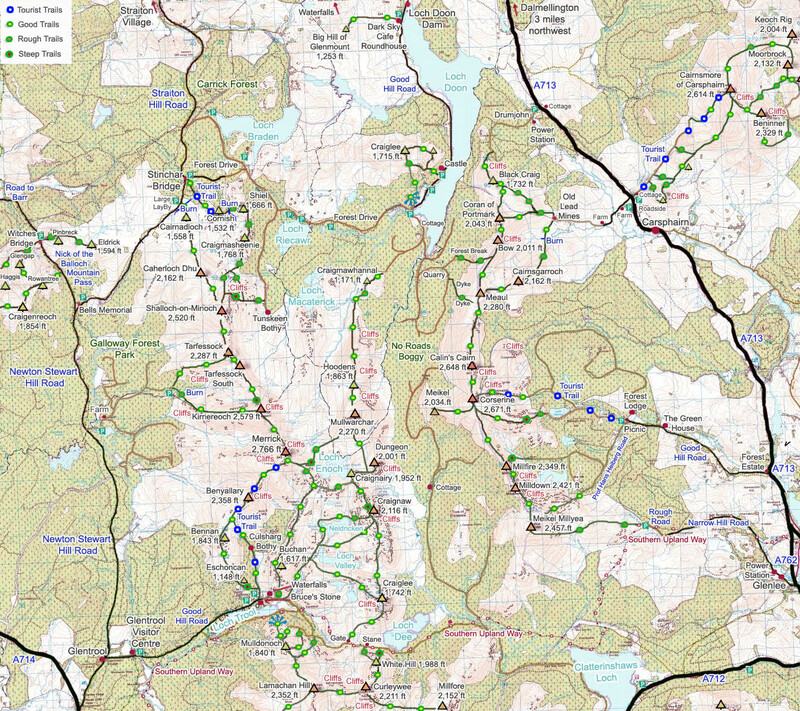 The Clatteringshaws and Kirroughtree Visitor Centres for biking and hiking are connected by biking trail, although you may need an OS Map to find your way between the centres. Other Biking and Walking venues in the area are Loch Doon 34 miles north, Dalbeatie 7stanes 49 miles east, Mabie 7stanes 61 miles east, and Drumlanrig Castle 53, miles northeast.